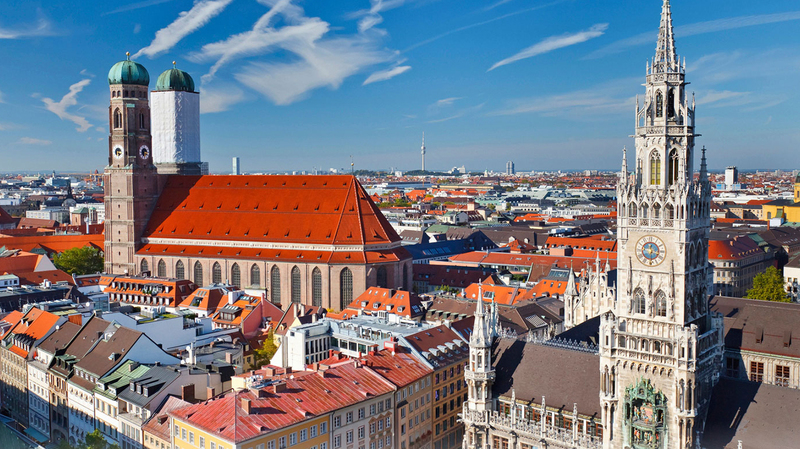 Search for the best flight prices from Manchester to Munich. Compare prices, book today and save money with Manchester Airport. A thriving arts and cultural scene. Pristine 18th century architecture, lovingly restored after the war. Easy access to the Alps. Some of Germany’s best museums. Baroque palaces. And, of course, one of the largest beer festivals in the world. In polls, Germans frequently say they’d like to live here. Come to Munich and you’ll discover why. Munich is as obsessed with tradition as it is with modernity – the phrase “laptop und lederhosen” was coined for Bavaria, the city’s home province – so there are some long-standing hotels. The oldest of the lot is the still-classy Hotel Torbräu (Tal 41), which has been drawing guests since 1490. Not so historical but even more indulgent is Rocco Forte’s 160-room Charles Hotel (Sophienstrasse 28), which has a spa. The Hotel Adria am Englischen Garten (Liebigstrasse 8a) is a less pricey option close to the parkland of the English Garden, while tiny Pension Prinz (Ascholdingerstrasse 1c) is a three-bedroom gem. The historic core of the inner city is an obvious starting point for shoppers, with the exclusive Maximilianstrasse playing home to numerous luxury stores and Sendlinger Strasse showcasing quirkier, artier goods. Close by, the sprawling Stachus Passagen (Karlsplatz) is Europe’s largest underground shopping centre – its Fair Trade Shop is a decent option for picking up memorable souvenirs. Elsewhere, the picturesque Glockenbachviertel quarter, the focus of Munich’s gay and lesbian scene, is great for sourcing creative new designers or one-off pieces of jewellery. For the month running up to Christmas, meanwhile, the seasonal market on Marienplatz is thick with atmosphere. There’s arguably no German city which displays greater reverence to beer, pretzels and sausage than Munich, and while it has some excellent places for a refined meal, it’s also a wonderful place to indulge in the homely comforts of a bratwurst stall and a litre stein of beer. The large open-air Viktualienmarkt is the obvious place to head for food on the go, with countless stalls serving up food throughout the day. For a refined evening, try the classic continental cooking at Dallmayr (Dienerstrasse 14) or the flair-filled dishes at Atelier (Promenadeplatz 2-6), while for the full bierkeller drinking experience head to Augustiner Grossgaststätten (Neuhauserstrasse 27). Often referred to as Oktoberfest’s little sister, Munich’s Spring Festival brings beer tents, fairground rides and live music to the open spaces of Theresienwiese. It’s on a much smaller scale than its bigger sibling, but still offers the chance of a rollicking good time. Munich has been in existence in one form or another since the eight century, although its official “birthday” is 14 June 1158. The date is celebrated with two days of festivities in and around Marienplatz, with craft markets, dancers and children’s activities. A programme of world-class opera and chamber music held across various city venues, the Munich Opera Festival is run by the Bavarian State Opera, which always uses the occasion to stage premieres. It’s common for the schedule to feature certain composers prominently. Taking place three times a year on Mariahilfplatz (usually in April-May, July-August and October), the Auer Dult events are ostensibly markets – porcelain, crockery and ceramics are all sold in high quantities – although it’s just as popular for its folk festivities, with fairground rides and Bavarian food stalls. The beer festival to end all beer festivals. Always kicking off in September (despite its name), Oktoberfest is a 16-day knees-up with a series of vast beer tents, food stalls, musical performances and other entertainment.